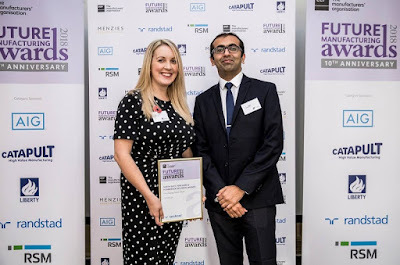 AESSEAL's successful year continues as the Rotherham manufacturer wins regional recognition at the prestigious EEF Future Manufacturing Awards. AESSEAL walked away with the Developing Future Talent Award, sponsored by Randstad Inhouse Services. This award recognises the manufacturer that has done the most to build skills, talent and develop their employees internally and/ or promote engineering and manufacturing careers through activities within the community. Richard Halstead, membership director for the North at EEF, said: "This award is testament to the hard working and dedicated team at AESSEAL. As a recognised name in the sector it puts them on the map for the Yorkshire region as a modern and innovative company and goes some way to demonstrate the valuable contribution made by local manufacturers, to the employees in our region. I'm sure they will be sharing this news with their staff, customers and suppliers." Sally Cleary, managing director at Randstad Inhouse Services, added: "People are critical to the success of any business. As the UK manufacturing sector continues to make a global impact, there has never been a more important time to develop and foster the skills of employees to remain at the forefront of innovation, particularly as the industry faces a skills shortage. Doing so is essential for any company wishing to stay competitive. AESSEAL fully deserves this award for the fantastic work that they do in nurturing their employees' skills. We wish them the best of luck in the national finals." The National Award Winners will be announced at the EEF National Gala Dinner in January. This year, AESSEAL invested £500,000 to double the intake of apprentices to 40 - 12 apprentices for its machine shop, and a further 28 people in other support roles. It has previously won recognition for its bespoke Manufacturing Apprenticeship programme. Rebecca Clubbe, marketing communications manager at AESSEAL said: "Today's new recruits are tomorrow's leaders and providing them with the skills and tools to excel will ensure our businesses future for the long term. The change happening in manufacturing as we move into the fourth industrial revolution is huge and it is this new generation who will have the ideas and the skills to meet the challenges."